The Trump tax return reveal, courtesy of NBC News two nights ago. Fascinating look at how the American media has now become a circus of ideology and cynicism. Let’s look at the facts. Someone gave far left reporter David Cay Johnston two pages of Donald Trump’s IRS returns from 2005. My main man Dave said, it simply arrived in his mailbox. What a lucky guy. (Please sense the sarcasm.) Johnston then gave the documents to MSNBC, and return, for putting him on the air to spout all kinds of gibberish on challenge. That was the deal. The return shows that Mr. Trump rendered to Caesar what was legally required. Now, before the actual return wasn’t shown to the audience, the cable news host, Rachel Maddow, delivered a TWENTY minute monologue. She said twenty minutes worth of stuff, describing various anti-Trump conspiracy theories that she espouses on a nightly basis. It’s kind of a hobby. It was kind of hard to follow Miss Maddow, as she hopped from Azerbaijan to Cyprus to Palm Beach to the U.S. Attorney’s office in New York City. There was a Russian oligarch, bad people from Deutsche Bank, and a shadowy international transactional deal. Now, I kept waiting for Donald Trump to appear on the grassy knoll. But that did not happen. Perhaps, because they had to go to a commercial break. Then, the real fun started for two full hours, is a variety of anti-Trump merrymakers put forth more speculation than a panel at a UFO Convention, portraying the President as Dr. Evil bent on destroying western civilization as he pet his cat. Lost in the “Let’s get Trump” marathon, was the actual leak which is a felony. If it came from the government. My guess is the illuminati did it. (Again, please sense the sarcasm.) But I will check with David Cay Johnston. No doubt, MSNBC will derive ratings from this madness, which has had ever since they turned into this Syfy channel over there. But it’s not all about ratings. Those folks want to destroy Donald Trump. Anyway they can. That is the mission. And they are just getting started. As stated previously on the “My Positions” page, I feel indifferent about guns. 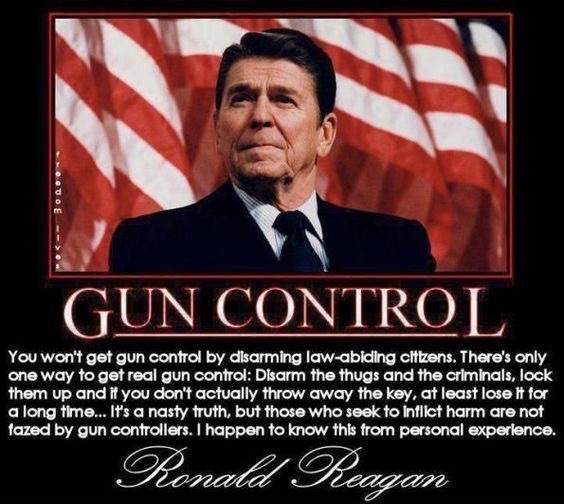 Ronald Reagan has basically stated what my opinion is on guns, and is what the entire country’s opinion should be too. The irrationality in some precincts and the dishonesty of some zealots and the absolute hysteria that surrounds some news stories is simply dumb and incredibly annoying. You get nowhere when you present the facts and they are rejected, so why bother? Facts don’t matter to these ignorant morons or conspiracists, why debate them? And the worst part is if you don’t see it the way that these far leftists do, then you’re branded as a racist. No matter how many facts you present to Nancy Pelosi, she is still going to tell you how great Obamacare is. No matter how many policy failures there were in the Iraq war, some conservatives will shrug it off and deny any mistakes. The propaganda element is worse on the left at this point in history, but the zealots on both sides spin it. They’re not looking for the truth. Now, back to Nancy Pelosi. Pelosi knows that her own city (San Francisco) is falling apart due to liberal policies and Obamacare is failing and has hurt far more Americans than it has helped. In her mind, she’s noble because in far-left tenets. For irrational people (like Pelosi), compromise is impossible and that’s why America is having a tough time. There are way too many irrational people. Eighty one percent of those with Obamacare will receive government assistance in 2017. Some people will have their entire healthcare premium paid for by the government. Obamacare cost American taxpayers $100 billion in 2016. That’s the essence of Obamacare. All Americans are forced to buy health insurance so that the have-nots can be subsidized and covered by the haves. It’s estimated that since Obamacare has been passed, thirteen million people have health insurance who did not have it before. Enter President Trump. He says that Obamacare costs way too much and is a disaster in every way. So the Republicans will put forth a new national health care plan. This one won’t order you to buy health insurance. If you don’t buy it, your option will be to go to the emergency room and get treated. If you can’t pay, the taxpayer picks it up just like the old days. If you can’t afford health insurance premiums, the Republicans want the states to handle it through Medicaid. President Trump and his acolytes essentially want out of the healthcare business. They’d send federal money to the individual states so they can handle it. But Medicaid tax dollars will be capped. Liberals don’t want that at all. They want the feds to dictate health insurance costs along with who gets it free or subsidized. That’s essentially where we are. The key question for you (the American people) is, will your healthcare premiums go up or down once when Obamacare is history? Yesterday, the Congressional Budget Office said that under the GOP plan, the feds would spend about $337 billion less subsidizing healthcare over the next ten years. But about twenty one million more Americans will not have health insurance by the year 2020. Again, that would mostly be their own choice not to have insurance. The Congressional Budget Office doesn’t know what might happen if insurance companies are allowed to compete nationwide, which they can’t do now. Will that drive premiums down? That’s the hope on the Trump side. But not on the left: Senator Bernie Sanders is angry because the GOP healthcare plan knocks out an Obamacare payroll tax and a tax on investment income. Sanders says that gives money to the rich people. That’s always the argument from the left. The left argues that any tax breaks, especially on investment income, helps the wealthy. But the Trump administration has promised to lower taxes. Their healthcare plan does that. It’s simply impossible for you (the American consumer) to know what is real and what is fake in this Obamacare debate. Summing up, liberals want a big entitlement culture. Some uber-conservatives want few, if any, entitlements. While more moderate conservatives want the states to handle healthcare entitlements with limits. President Trump Dismisses Appointees, So What? Forty six United States attorneys have been asked by the newly elected president of the United States to tender their resignations. So what? But to here it from the left you would think that this is just another affront to democracy and to our way of life by the Trump administration. In fact, I’m surprised that they didn’t throw in the Russians too. But why go quietly with dignity, when you can create chaos? But attorney Preet Bharara digs in his heels and and refuses to resign, and insisted for the President to fire him. Say what? Do you really think that you have a claim to this office? Now forty seven have automatically stepped aside, because they know the protocol, the remaining forty six attorneys are asked to tender their resignations. The “horror” comes out and Bharara cannot believe that this applies to him. But men bigger, gentler, and more powerful than Bharara have stepped down in years past when new administrations have come in. So since this happens all the time, what’s the fuss? The Trump haters have claimed that any change interrupts all ongoing investigations and prosecutions, and ultimately jeopardizes justice; especially where public corruption cases are being tried, justice is at state. Cut it out! Do you really think in the entire history of our country that a prosecutor (federal, state, local, village, or town) has been replaced by another one? What are we supposed to do when they die? Just give up? But because Bharara has such a huge ego, because he thinks he’s so all important, he couldn’t believe such a request would apply to him, he ramped it up, and dared the president of the United States to fire him. Author thereaganconservativePosted on March 13, 2017 March 13, 2017 Categories PoliticalTags america, bharara, capitalism, conservative, conservative movement, D.C., dc, free market, free marketplace, laissez faire, limited government, only in America, patriotism, Political, politics, preet bharara, proud American, reagan, right wing, ronald reagan, Trump, trump administration, us, usa, washington dc, white houseLeave a comment on President Trump Dismisses Appointees, So What? There is great confusion all over the country about rights and what the government really owes us. Essentially, there are three major expectations that the government should meet under the constitutional banner of the pursuit of happiness. Number one, security. We are entitled to have an effective defense against people who would kill us. But today, our security is wobbling because of hackers and leakers, and the federal government does not seem to be able to stop the espionage. While many Americans don’t pay attention, this issue, that we cannot guard our defense secrets or even protect the President of the United States when he talks to a foreign leader, is something that America has never seen before. The high-tech world is creating threats to our security that are almost out of control. This is, perhaps, the most important issue the federal government faces right now. But close to that is health care. Since Obamacare was passed, Americans now are entitled to an affordable medical system that can alleviate their suffering. All of us are going to get sick, and we will need help. But right now, that help is confusing, to say the least. The guiding principles of health care should be that is financially reasonable, affordable, but you have direct access to the doctors you want, and that you are not bogged down in a chaotic system of red tape and delays. So Congress has a lot of work to do, to put a fair health care system in place. Finally, all American adults should have access to the free marketplace. By that I mean, you can’t be denied a job because of your color, your race, or anything else. Also, the government needs to put SENSIBLE guidelines in place that protect workers from exploitation with many unions now politically corrupted, the Feds and the states have much more responsibility to working Americans. That’s it. That is all what we are owed. The Bernie Sanders philosophy that everybody should be guaranteed a job and a set wage and shepherded through life is not what America is all about. We compete here but in some cases, some Americans are not treated fairly in the marketplace. Best example, children from families who don’t really care about them. These kids are often thrown into awful schools and wash out early without much of an education. They have little chance to succeed economically in this country. For far too long, Americans looked away from that reality. Every American child deserves a quality education, and right now, the system is not providing that for millions of kids. That must change.